Television polls released Thursday evening indicated Benny Gantz and Yair Lapid’s new Blue and White electoral alliance would win more seats Prime Minister Benjamin Netanyahu’s Likud, but would still likely struggle to cobble together a governing majority. Gantz and Lapid announced before dawn Thursday their Israel Resilience and Yesh Atid parties had agreed to run on a joint slate in April’s Knesset elections. Also part of the alliance is Moshe Ya’alon’s Telem, which teamed up with Israel Resilience last month, and Gabi Ashkenazi, who like Gantz and Ya’alon is a former military chief. According to separate polls aired by channels 12 and 13, Blue and White would win 36 seats in the election, making it the largest party in the Knesset ahead of Likud. 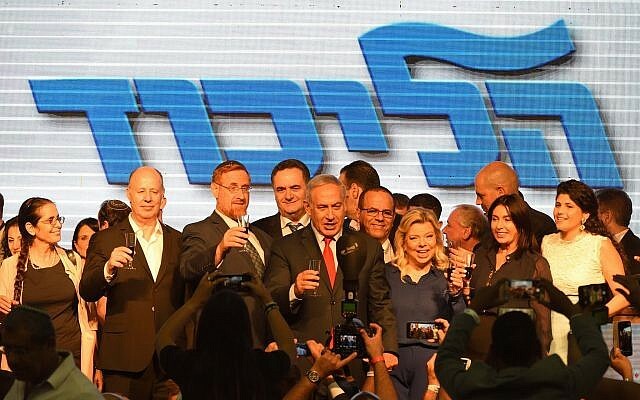 While Channel 12 news put Likud at 30 seats, close to its current average in polls, Channel 13 news said the right-wing party would drop to 26 seats. Following Likud in the Channel 12 survey was the Labor Party with eight seats — a slight drop from the bump it saw in polls after its primary earlier this month, but down from the 19 seats it currently holds. Channel 13 gave Labor five seats in what would mark a historic low for the former powerhouse in Israeli politics. 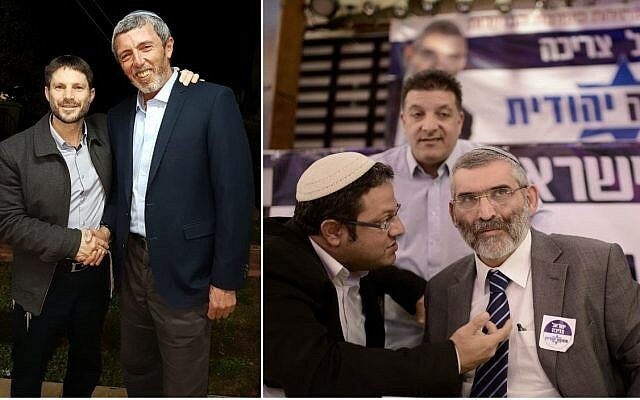 Both polls gave United Torah Judaism seven seats, while fellow ultra-Orthodox Shas was forecast to get six by Channel 13 and five by Channel 12. The New Right, which was founded at the beginning of the election cycle by breakaway Jewish Home ministers Naftali Bennett and Ayelet Shaked, would get five seats according to Channel 13, one less than its tally in the Channel 12 survey. Channel 13 gave the pro-settlement Jewish Home, which reached an agreement Wednesday to run on a joint ticket with the extremist Otzma Yehudit, eight seats, double the total it received in the Channel 12 poll. Meanwhile, the left-wing Meretz was forecast by both surveys to win four seats, as was Finance Minister Moshe Kahlon’s Kulanu. Former defense minister Avigdor Liberman’s Yisrael Beytenu would get four seats, according to Channel 12, one less than in the Channel 13 poll. Though the Arab parties currently in the Knesset had yet to submit their final lists of candidates by the time the surveys were aired, and alliances were still possible, Channel 12 gave the various Arab parties a total of 12 seats, while Channel 13 projected 14. Neither poll had MK Orly Levy-Abekasis’s clearing the threshold, after it announced Wednesday it would run alone and not merge with Israel Resilience. 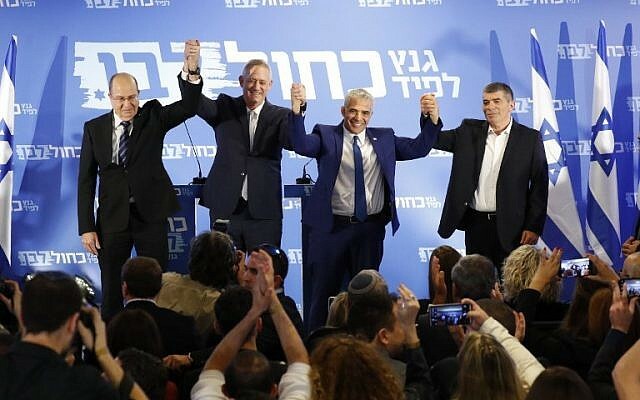 Despite outscoring Likud in both polls, the centrist Blue and White would still likely struggle to form a government, with Channel 12 giving right-wing and religious parties 60 seats, and 60 for the center-left and Arab parties. Those totals were 61 seats for the right-wing bloc and 59 for the center-left and Arab parties in the Channel 13 survey. While horse-race polls are an almost daily occurrence in Israel in the months leading up to elections and are not seen as overly reliable, taken together the surveys can often serve as a general gauge of the political climate and where the vote may be headed.